Habitat: Slopes, valley, plains and arroyos, in lower tropical deciduous forest with thorn shrub, tropical deciduous forest and the southern edge of Sonoran desert shrub, from near sea level to1000 mt. Ecology: This species has a self-incompatible, hermaphroditic breeding pollination system and depend both on nocturnal and diurnal pollinators. They attract especially nectar-feeding bats for their reproduction. Although flowers open at night, they remain open and continue secreting nectar during the morning, allowing visitation by both nocturnal and diurnal pollinators. Pachycereus pecten-aboriginum f. cristata hort. Stem: Individual branches, deep green, closely set, ascending, erect, relatively slender up to 12-18 cm in diameter. Areoles: Up to 1 cm in diameter. Spines: Few, sharp, rigid, white to grey. 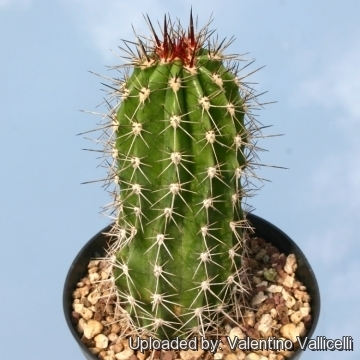 Central spines: 1 or 2, well developed spreading to erect (or slightly curved). 1 to 9 cm long. Radial spines: 8-12 short, spreading. 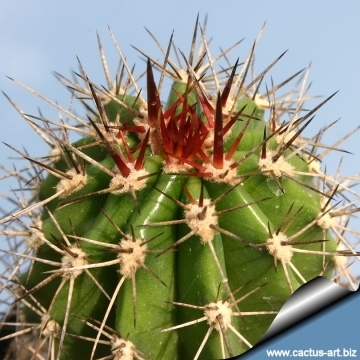 In mature specimen the areoles bear only a dense tuft of bristly spines, the longer one often 1-3 cm long. Flowers: White with reddish brown exterior, showy with purplish outer petals, 5 to 10 cm long, with a floral tube covered with dense brown velvety wool. Tepals white, floral bracts 13-20 mm long. Blooming season: Unlike other columnar cacti it may flower at any time, even though late winter and spring is the most common. The flowers are nocturnal, open in the evening and closing about midday. Fruit: Red 6-7.5 cm in diameter splitting apart at maturity and densely covered with 5 cm long, golden yellow spines. they are relatively harm less and seldom penetrate the skin. The pulp is firm and scarcely juicy. 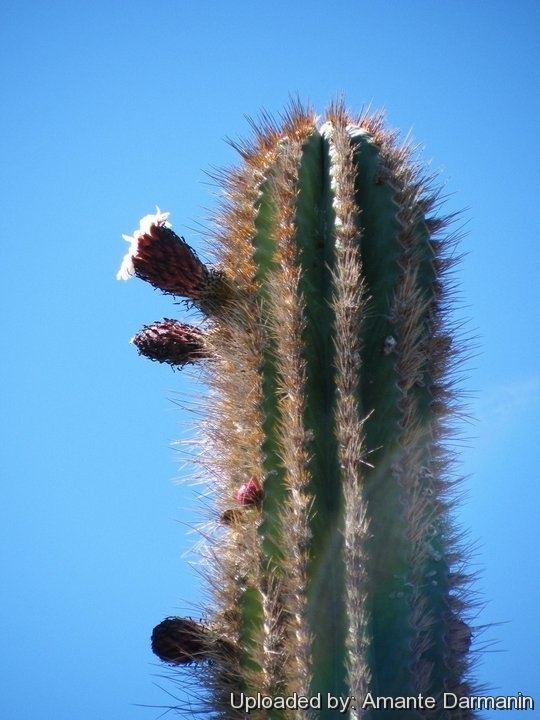 The developing fruit appears to form large golden clusters on the arms, giving, the giant cacti an attractive appearance. Cultivation and Propagation: It is a fairly easy plant to grow. During the summer it is best to keep the plants outside, where the temperature can rise to over 30 C with no harm to the plant. Furnish good drainage and use a an open and free draining mineral compost that allows therefore roots to breath. They like only a short winter's rest, and should be kept almost completely dry during the winter months. If the soil is allowed to be dry for too long, root loss could follow but equally the same result would occur if the plants were both wet and cold. From March onwards the plant will begin to grow, and watering should be increased gradually until late May, when the plant should be in full growth. Water regularly during the summer, so long as the plant pot is allowed to drain and not sit in a tray of water. During hot weather you may need to water the plants more frequently, as long as the plant is actively growing. From late September watering should be reduced, to force the plant to go into a state of semi-dormancy. By October you should be back in to the winter watering regime. It needs full sun, avoiding only the harshest summer sun. If kept too dark, plants may become overly lush and greener, and could be prone to rot, due to over-watering. Feeding may not be necessary at all if the compost is fresh. Then feed in summer only if the plant hasn't been repotted recently. Do not feed the plants from September onwards, as this can cause lush growth, which can be fatal during the darker cold months. Grown specimens resist to -4°C for a short time, but it is best to keep above 0° C to avoid ugly spots on the plant's epidermis. Propagation: Seed or by stem cuttings from adult plants (but cuttings are difficult). Pachycereus pecten-aboriginum is easy to grow from seeds. Sow seeds in sandy soil. Do not cover the small seeds, but press gentle into the earth. Keep seeds in constant moisture with temperatures of about 20 degrees C. In winter, the dormant period, plants should be watered very carefully. In summer they may be watered more often. A) The fruit pulp is eaten fresh or cooked and often made into preserves or syrup, and it was formerly used to make wine. B) The are ground and mixed with some corn flour to made tortillas, which have a blue-berry like flavour. C) To make a hair brush, the spines are removed from about two-thirds of the fruit, and the remaining spines trimmed to about on cm in length, hence the the species name pecten-aboriginum, which translates as "native comb"
d) The Tarahumara Indians of Mexico use the branches to make a sacred narcotic drink and causes dizziness and visual hallucinations. E) It was also used for healing. The Indian cut a piece of trunk and anoint a wound with the cut surface to stop hemorrhage.